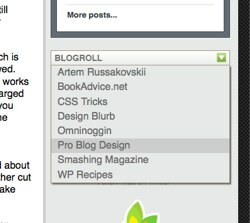 What do you think of the blogroll in my sidebar? It takes up very little space, sweeping all of the links out of sight until they’re called for. When you hover over it, they snap down. A tagline is a short line of text that runs underneath your site’s name. It says something about your site, and adds to the first impression. In my opinion, the best taglines are both humorous and descriptive. (Of course, humor may not be appropriate for some sites, but it still pays to be descriptive.) Your tagline should sum-up your blog in one sentence. Taglines are by no means exclusive to websites. Traditional publications use them, corporations have them, and even movies have taglines. Who hasn’t heard (or heard references to) “Think Different” or “Yo Quiero Taco Bell”? What about “A long time ago in a galaxy far, far away…”? Just run a Google search on “tagline” and you’ll find plenty of corporate taglines. Or look at IMDB.com, and you’ll notice that they list the tagline(s) for all your favorite movies. For more funny taglines, check out The Best Website Taglines Around the Internet. Consider adding a tagline. Whether you decide to be funny or not, be sure to check out Copyblogger’s guide to writing taglines. My guest post 7 Ways to Make Your Blog Stickier has went live over at ProBlogger. (I was wondering why my RSS subscriber count jumped up 30+ readers today…) And, I thank you, Darren, for providing the opportunity to guest-post on your blog.